These positions were started over previous weeks. You need to be a paid subscription for real time signals. Sector Funds, ETF and Stock positions are not included above. "If volatility gives you gray hair, then this week likely turned it all white. Huge declines to start the week, a big next day rally, Thursday another selloff and then Friday a rally that ended the full week with a +0.49% gain. That gain leaves the S&P 500 Index (SPX) right at resistance. The highs in May stopped the index at about 2740. That is the next level needing to be topped." This week was another breakout week for the S&P 500 Index (SPX) as well as the Nasdaq 100 Index (NDX) which we will look at here. The daily chart below shows the early May breakout rally for the SPX, and then a top that held for the rest of the month at about SPX 2740. On Monday of this week the SPX gapped up at the open and closed above the 2740 resistance level. That gain was followed by a week of solid advances. The SPX closed the week with a gain of +1.62%. 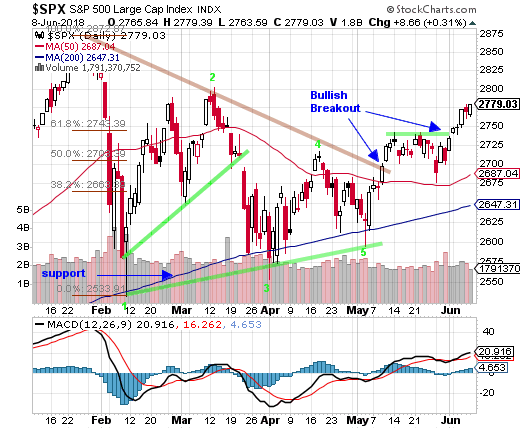 Last week we wrote: "Breakouts or breakdowns from pennant patterns, as seen in the below daily chart of the SPX, typically point to the direction the stock market will now take. That points to an upside move soon to take out those May highs." 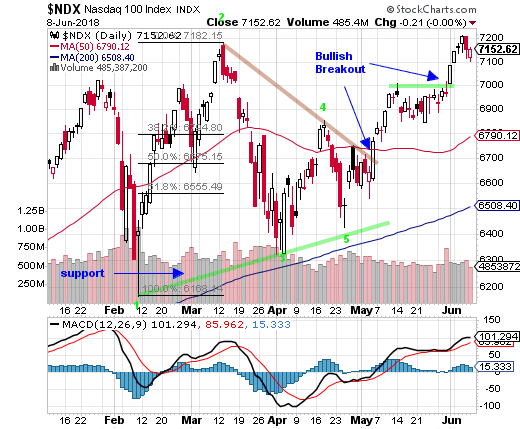 The same chart pattern can be seen for the NDX which broke above resistance in early May, then traded sideways for the rest of May. On Friday of last week the NDX broke out a second time above its May highs. The NDX then posted another weekly gain of +0.97%. Small caps did not bother with breakouts and have been outperforming for the entire month of May. Small caps did breakout above resistance, the declining trend resistance line in the below chart, in early May but since have steadily moved higher.